The arts are an important part of the St. Augustine Catholic School. In addition to weekly music and art classes, students can participate in a band, chorus, and art club. Additionally, middle school students can participate in lunchtime theater club. Students in grades four through eight may enroll in the Instrumental Music Program. Lessons are held during school hours, once a week for one half hour. Band lesson times rotate so that students have their band lesson at a different time each week. It is the responsibility of each student to contact the teacher of his or her academic subject(s) for any missed work. Band practice is held before school once a week for students in advanced band. The school partners with the Instrumental Music Program to offer a Band Program. In 2019-20, Mrs. Stephens, our music teacher will be incorporating string instruments for 4th and 5th grade students. Those who sing, pray twice! 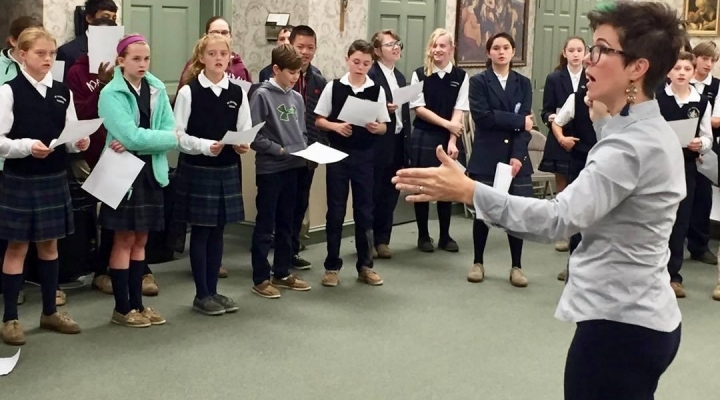 Students participate and sing liturgical music for weekly Mass as well as prepare music for concerts at Christmas and in the Spring.